From a fully functional American diner through to Google’s unnerving house showing how technology has taken over our lives, we round up our favourites from this year’s Italian design festival. Walking the busy streets of Milan this month, Italy’s biggest hub for fashion, design and business, the number of installations, exhibitions and fairs gracing the city is overwhelming. Salone del Mobile – otherwise known as Milan Design Week – is now in its 57th year, and while it initially began as a furniture fair, it now encompasses the whole metropolis with design quarters featuring everything from digital, graphics and print to interiors and products. Alongside the existing main hubs of Brera and Tortona, last year saw a new hub established in the centre of the city called Ventura Centrale. 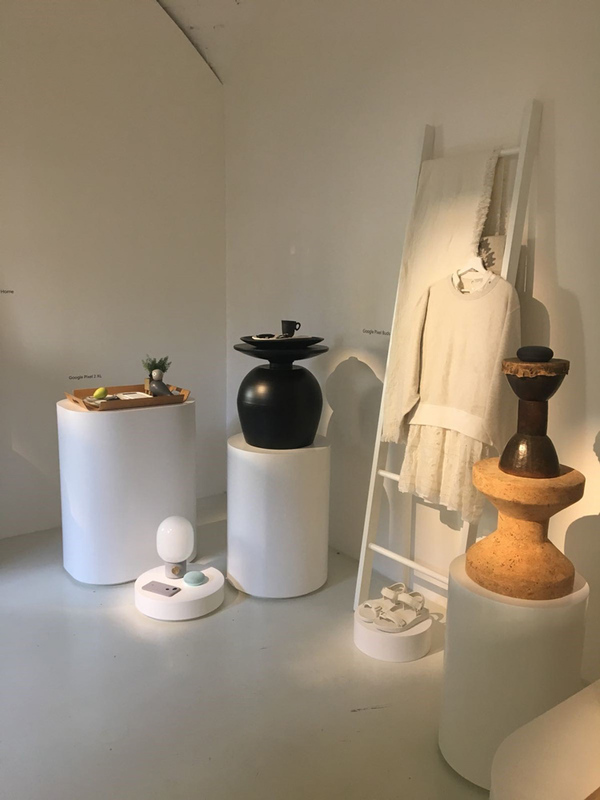 This year, Ventura Future became a new edition, dedicated to showcasing the work of up-and-coming, graduate and student designers. While the majority of paying delegates busy themselves at the furniture fair, Milan Design Week’s main attraction, the rest of the city boasts a wealth of free events and displays which bring the high-end event down-to-earth and making it accessible to a wider audience. As this year’s show draws to a close, here are some of our highlights from this year’s Milan Design Week. As connected home products become more a part of our everyday lives, tech is increasingly being integrated into the fabric of the home. Whether you find it frightening or enlightening, heating, lighting, locks and even ordering groceries can now be controlled by the touch of a phone or voice activation. Google’s installation Google Softwear – a clever play-on-words combining computer software and furnishings – looked at the future of this ever-growing relationship between the physical and the digital. Kitted out as a small house that visitors could walk through, it featured furniture and product collections, including sofas, teapots, speakers, lamps, plants and more, with pink, blue, orange and pastel shades dominating the space. Tech and homeware products were intermingled, coordinated by colour and material, with the same textile used for a sofa as for a speaker or virtual reality headset. It aimed to represent how tech “naturally fits into the composition and environment of the home”, says a Google employee. One room also featured embroidered textile hangings on the wall, which act as pieces of art but are made from materials used to make real Google hardware such as computers. The space, while it appeared idyllic, peaceful and beautiful, was also foreboding, reminding its visitors of how reliant we have become on tech, as well as our increasing acceptance to have our data constantly collected and monitored. Fittingly, one of the hanging textiles featured a surveillance camera, cutely colour-coordinated against a speaker. 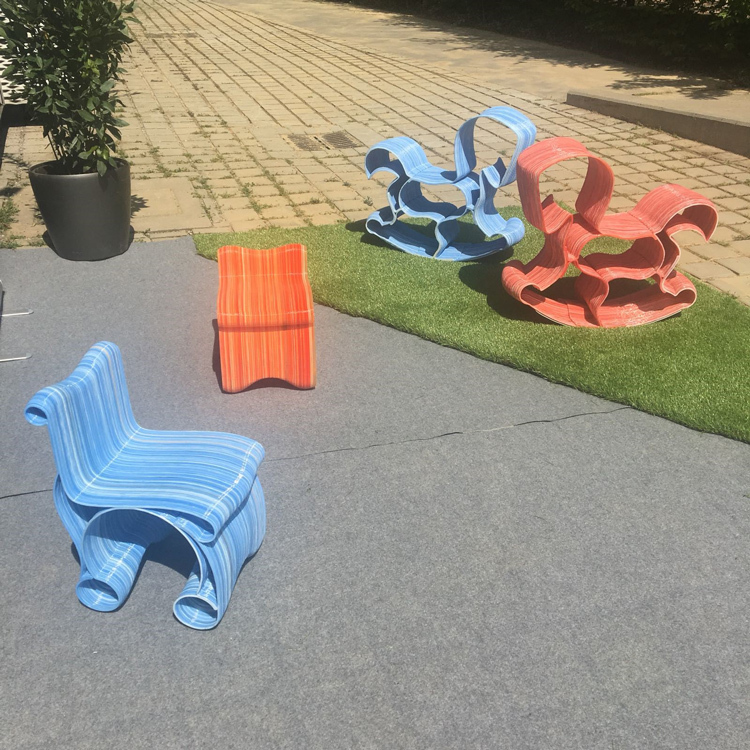 Hidden by the headquarters of the Isola design district was a little garden filled with an array of colourful, 3D-printed stools, rocking horses and chairs. Alongside these sat a working 3D-printer, turning a liquid material called polylactic acid (PLA) into solid toys and furniture for children. The 3D-printed playground is a project by Italy-based Caracol Studio, and aims to be a sustainable solution for making new products, with the hope that this could be applied to adult furniture in the future too. While it looks like plastic, PLA does not have the same environmental issues as it is made from natural materials such as corn starch and sugarcane, so can decompose. The 3D-printing process also produces less waste than traditional furniture-making, as the exact amount of material that is needed is used. Paolo Cassis, designer at Caracol Studio, says that this particular type of 3D-printing also allows them to create “free-form” rather than sticking to a pre-defined axis, which gives more variety of shapes. He adds that the design team, who have been working on this project for three years, wants to encourage designers to use 3D-printing on a furniture and architectural scale more frequently. 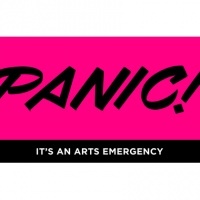 In the Ventura Centrale strip of different exhibits and installations, one stuck out for its ingenuity and vibrancy – and for proving that sticky tape is not just for wrapping presents. Japan-based manufacturing company Nitoms is behind a colourful selection of adhesive tapes called Haru Stuck-On Design, intended to be used as an art and design material rather than just a mechanism to hold things together. 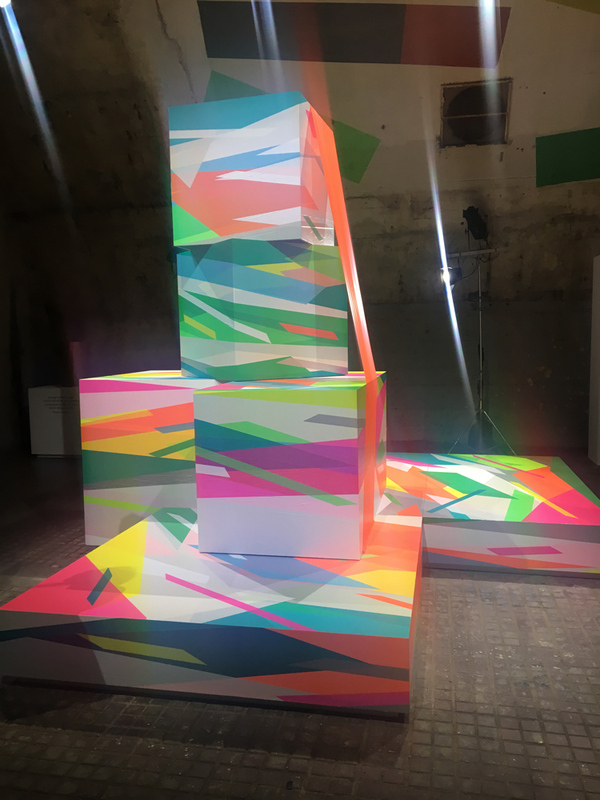 The Haru Stuck-On Design exhibition room featured multiple examples of this tape in action, from ceiling designs through to art installations, accompanied by quotations of authors, artists and designers discussing the power and influence of colour. Accompanied by lighting that constantly dimmed and brightened, causing the shades of the tape to evolve, the space demonstrated how versatile and ever-changing colour is, and also the impact it can have on people’s moods. 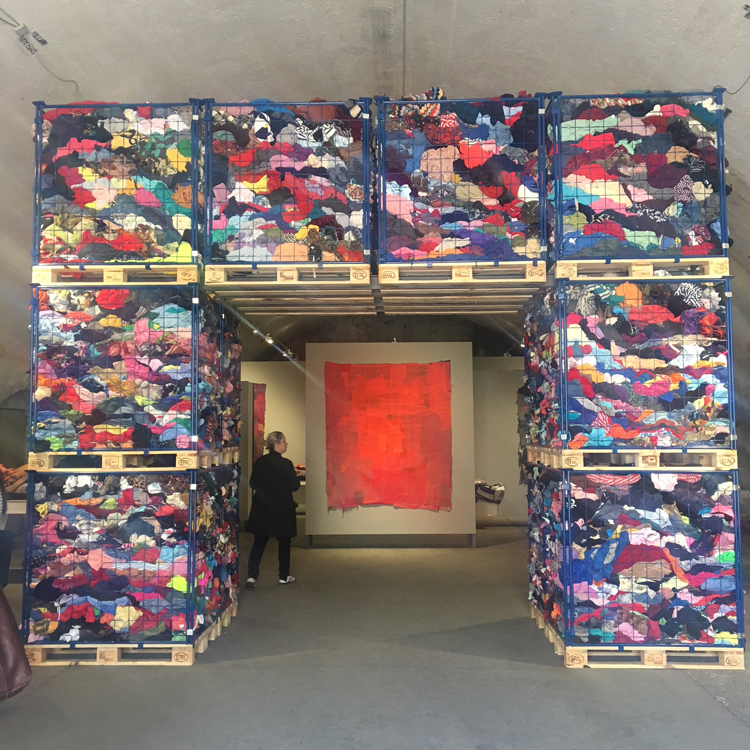 As you entered DesignWork’s Waste No More exhibition space, you were greeted with a tremendous arch made out of thousands of pieces of old clothing – not dissimilar from what you might see in a vintage clothes store, but perhaps more artistically arranged. Behind this were a series of hap-hazard wall hangings, cushions and pieces of furniture, composed out of these old scraps of apparel to create a rather abstract and colourful aesthetic. The scrappy installation demonstrated clothing business DesignWork’s sustainable vision. Founded by designer Eileen Fisher, the company rebuys back old clothes, and either sells them as second-hand items if they are in good condition, or if they are beyond repair, repurposes them into entirely new items made from a “collage of scraps”. The unique designs on show demonstrated the beauty in such makeshift items, and aimed to stop the perception that used clothes are purely “waste”. This is a much-needed attitude in the fashion industry, which produces an astronomical amount of landfill waste every year. Stepping into The Diner was like time-travelling back to 1950s America, with a futuristic, Blade Runner-esque twist. Designed by David Rockwell, The Diner was a fully functional American eatery, where visitors – or customers – sat around a circular, central bar and ordered burgers and milkshakes. 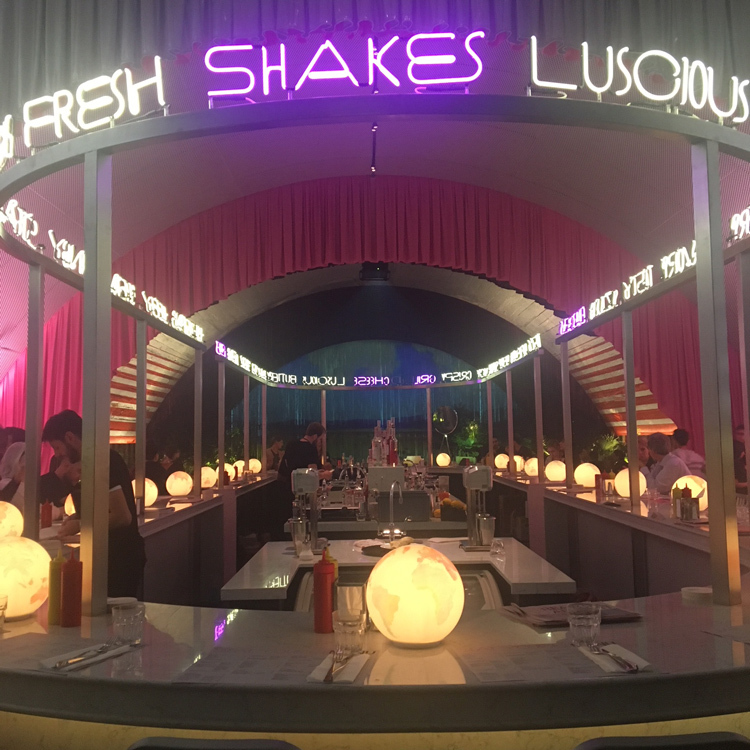 Visitors journeyed through the US as they navigated the space, which is split into four distinct design aesthetics referencing styles from different parts of the country – the Roadside Diner, the East Coast Luncheonette, the Midwest Diner and the West Coast Diner. Everything was accounted for; brightly-coloured fabric stools, extravagant and ostentatious globe-shaped lights on the tables, illuminated typography, and a backdrop framing a desert landscape all referenced the US in some way, from its culture of excess to its scenery. As if that was not enough, design consultancy 2×4 was also brought in to create the typography, graphics, signage and print materials for the space, including menus, lit-up signs and even an old-school newspaper detailing the design and thinking behind the exhibition space. The Diner successfully transcended era by referencing long-established styles but adding a modern twist, giving European visitors insight into American design without appearing clichéd or dated. Milan Design Week took place 17-22 April 2018, across various locations in Milan, Italy. For more info, head here. To read about the Lexus Design Award, an annual award that looks to bring sustainable designs to market that takes place at Milan Design Week, head here. These ‘colourful, 3D-printed stools, rocking horses and chairs’ are worth only for looking. Would you let your child use them? They are rigid and obviously not safe. 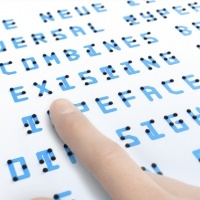 I like the idea of 3D printing, but it should make sense.